Last month, naval divers recovered the body of the 16-year-old boy who drowned in Seletar Reservoir. For them, a 'drowned body job' or the recovery of a drowned body is probably the most gruesome part of their work. Imagine being submerged in water for hours and combing the murky depths for a bloated corpse which sometimes has begun to decompose. You're not sure you can find the body. If you do, you can finally go home and get a much desired shower. If you don't, well, you don't. It isn't a pretty sight, let me tell you, although I was never a naval diver myself. And then you have to bring it to the surface. Even diving gloves don't mitigate the horror of touching the cold dead flesh of a recently drowned human being. Unless, of course, you happen to be me. Then you almost sort of look forward to them. 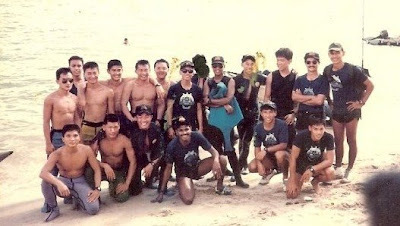 You see, many years ago, during my full-time NS stint, I was an underwater medic in the navy. One of my duties was to accompany naval diving teams on their assorted 'jobs' in case of any medical emergency. Fortunately, I didn't have to do any diving, even though I was in the first batch of underwater medics to complete the basic underwater diving course. The course was the most interesting thing I ever did in my life at that point. Since then, the most interesting thing I ever did was share a lift with MTV VJ Denise Keller. Twice. My first drowned-body job was on St John's island. An old woman had fallen into the water while disembarking from a ferry and drowned. Our task wasn't to rescue her, but to retrieve her remains. I remember that it was a lovely day, apart from the fact that someone had just died a horrible unexpected death. I waited with my medical pouch, oxygen tanks and automatic resuscitator set on the jetty while the divers searched for the body below. I think it was also the first and only time I had been to St John's. I was enjoying the change of pace away from my regular routine at the base medical centre - and then the divers found the body. After she was brought to the surface, foam oozed out of her mouth, which is what usually happens in drowning cases. It was an indelible image for a bookish then-20-year-old homebody like me. I was grateful my job wasn't to save her (so, no mouth-to-mouth, thank goodness!). My job was only to take care of my divers. I tagged along for several more drowned body jobs after that, but that was the only time I ever saw a corpse. Because of these memorable experiences and more, I now look back on my years of national service with a perverse nostalgia as I'm soon about to 'retire' as an operationally-ready NSman. Is it simply the mourning for lost youth? Or is it due to the sad truth that if it weren't for NS, my life would be even more boring than it already is, Denise Keller notwithstanding. My next in-camp training will be my last. It won't include drowned body jobs.